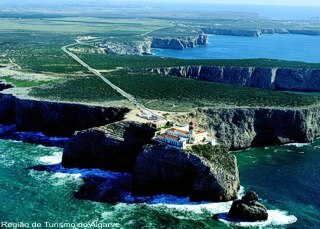 Sagres is right on the southern coast of Portugal in the western end of the Algarve. The clear blue waters of the Atlantic and beautiful sandy beaches make it an extremely popular destination for surfers and divers. Unlike most resorts in the Algarve, Sagres is still relatively untouched by tourism, and so it is ideal as an escape from the hustle and bustle of other resorts. The town itself has the distinction of being the home for the 15th century School of Navigation by Prince Henry the Navigator, son of King John 1 of Portugal. It attracted some of the finest mariners, astronomers, and ship builders during the Age of Discoveries, which ultimately enabled Portugal to set out on epic exploratory voyages. Consequently, Sagres has earned a significant place in history. Prince Henry’s home was a 15th century fortress, Fortaleza de Sagres, which was destroyed by Sir Francis Drake in 1587. It was later rebuilt in 1793, and inside is a former 16th century monastery and 14th century chapel. There is also a fascinating 39m in diameter wind compass. If you carry on past the fortress along the headland, you will come to a lighthouse built in 1867 to guard one of the world’s busiest shipping lanes. It claims to be the second most powerful lighthouse in Europe, with views that are absolutely breath taking. Sagres has its own Pousada, which is really quite special situated on top of a cliff overlooking the ocean. Guests can look down at the bay as the ships anchored below, as they wait for suitable winds and tides before they head out into the Atlantic toward northern Europe. The Pousada Sagres (Hotel do Infante) has excellent facilities, which include a swimming pool, tennis course and heliport. It also has an excellent reputation for its seafood cuisine using only local produce. The three most popular beaches in this area are; the Praia da Mareta which is 5 minutes from the town centre, Praia do Tonel which is on the northern point and popular with the surfers, and the Praia do Martinhal which is on the eastern side which is quieter than the other three. There are many different activities to enjoy as well that would also be suitable for families such as horseback riding and a water park. However, for the adults there are more adventurous activities including hand gliding, mountain biking, deep sea fishing and cruises. The Algarve is famous for its superb golf courses and not far from Sagres is one such course. Ria Formosa Natural Park is worth visiting as well. The sand dunes of the reserve were originally formed by the great earthquake in 1755, and although traditionally the area was used for salt production, today it is mainly oyster and mussel farming. Many archaeological finds have revealed Roman and pre Roman settlements. However, if you are nature lover, perhaps the biggest appeal would be observing the wide variety of species that are protected on the reserve and include migratory birds which winter there. There are also birds of prey and the native water dogs which are almost extinct. Only 20 minutes from Sagres is Lagos, a larger town with excellent shopping, lively nightlife, and more beaches, many of which are not only beautiful but fairly quiet. Surrounded by rugged and beautiful scenery Sagres has it all, from surfing and diving to golf and horseback riding. It has fun for the family, interesting experiences for those interested in wildlife and even provides you with a rather luxurious Pousada to compliment your holiday.